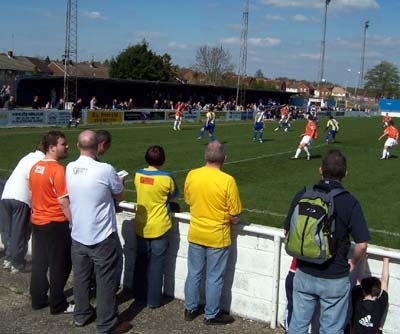 As well as being a sunny bank holiday worthy of the name, today represented ten years to the day since I attended my first Havant & Waterlooville fixture. It’s been a story of ups and downs since then of course, as it is for all football fans but, in fairness, we’ve had far more ups than most, particular if you consider the sheer loftiness of those ups. 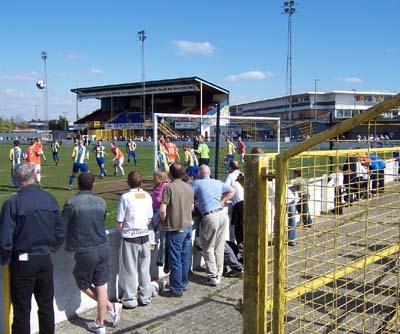 This season, though, will represent a down simply for the fact we had got to April without being able to categorically say we wouldn’t be returning to a Southern League which has diminished in status since we were last there thanks to the formation of the Conference’s second tier. Much as it might be nice to visit some new places, y’know, I’m quite happy to leave that to the vagaries of the Cup draws, or by leaving the division in a more skywardly manner. We came into this Easter weekend imagining that two wins (or two draws and at least one defeat for Thurrock) would mean safety was mathematically assured as opposed to just ‘most likely’. As it was we were pretty much able to hand around the cigars last Thursday with the announcement that university side Team Bath would be following the relegated Bognor and Fisher out of the league by resigning from the Conference South and, seemingly, from the football pyramid entirely. Theoretically, the space created by Team Bath’s demise could be applied across the level (i.e. including Conference North, ‘saving’ whichever third bottom side finished with the most points) but to my mind that should only happen when teams drop two or more levels from the Conference Premier. If a team drops out of the Conference South then surely the gap is created in the division rather than equally at that level. Of course, the levels below will have to sort out their gap issues fairly and equally given that it appears Team Bath will be parachuting, whilst tied to an anvil, straight through. One can never delight in teams collapsing but Team Bath’s rag week challenge did seem to have got a bit out of hand. Given their presence was about as welcome as the knock from a door-to-door seller of ironing board covers, they will not be greatly mourned. Ordinarily you’d empathise with their fans but they’ve kindly helped us out in this regard by not having any. So the season now has a weirdly anti-climactic feel to it. Not that I’m suggesting I would prefer a last minute equaliser on the final day of the season being the point where safety was assured but the drama has been sucked out of the remainder somewhat. Just as well then that there’s only a fortnight left to do the pride salvaging tour. The first half of this game at our fellow thin-ice skaters Basingstoke certainly had that end-of-season ‘minds-eye-concentrated-on-the-window-display-at-Thomas Cook’ feel to it. Frankly I’ve seen withered cadavers with more vitality. 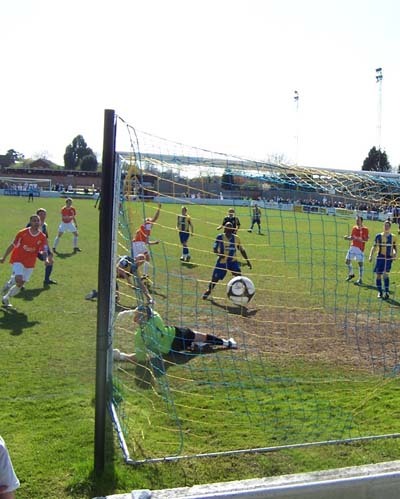 Basingstoke scored with five minutes of the half courtesy of an exquisite dipping shot from Phil Ruggles which should have been disallowed simply for not being in keeping with the gaunt ennui of the forty minutes preceding it. As m’chum Mr Ketchup and I formulated later, while the first half was all pre-season daises-in-the-centre circle stuff, the second was more your blood and thunder cup tie derby in tempo. Mr K has been getting increasingly paranoid recently that things that spill out of his talk-hole seem to have a pretty good chance of re-appearing on these pages. Clearly, he has a point. Our hypothesis on this occasion was correct though, it genuinely was a game of two halves, and we did the rare thing of coming out for the second half with not a little determination in our stride. Within three minutes of the re-start young midfield dynamo Wes Fogden, looking increasingly the class act around which we can have another go at building a side, got tricksy in the box and found a way through the bodies [see picture below] by tilting his in such an unnatural shape he could have modelled for Picasso. After his equaliser we dominated proceedings up until the point, and writing this feels oddly familiar, where the opposition scored again. Awarded a free-kick on the edge of the box, David Tarpey curled one around the wall and out of the reach of Kevin Scriven. However rather than disintegrate we piled on the pressure, which was eventually rewarded when Guy Butters, making a rare start in place of the injured Sir Gary Elphick, met a ball into the box at roughly the same time as Luke Nightingale. There has been some debate as to who got the final touch but while official sources claim it was the BFG, the fact that after both raised their hands the big fella went over to Luke, to ruffle his hair like he might a puppy on its first retrieval of his slippers, suggests it should be accredited to Nightingale. Mind you, Guy certainly deserved it for putting in a good, solid performance after a season on the sidelines and for the fact he always looks like he’s pushing himself to the limit. This is made apparent by his head turning a deep, flamboyant shade of red whenever he has to run anywhere. Some might suggest this a fitness issue, the ‘F’ in BFG not standing for ‘Friendly’ in Big Guy’s case if you know what I mean, but considering he was playing, very successfully, in League One last season, it’s fair to say being a svelte whippet has never been part of his game. So, two games to go with our ambitions now limited to 13th place at best, and the prospect of Eastleigh giving it large when they turn up at our gaff on the final day of the season. It’s enough to wipe away any ‘cheerful’ left in the tank. As it is though, our Easter weekend was a decent boost, three goals and three points at home to Fisher than an away draw which reminded us of the good old days when that wasn’t considered so bad a thing. 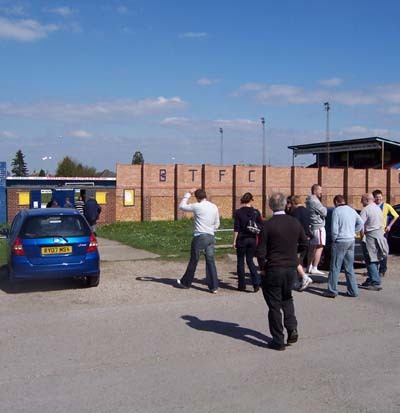 Not that I wouldn’t appreciate a win at Bishop’s Stortford this weekend, of course.